I can sign into mywebrootanywhere.com and can access my account but cannot sign in to password manager using the same email and password. A red bar appears saying unknown email address try again. No typo, I tried it about ten times. Four score and seven years ago today....the Password Manager went missing, never to be heard from again. The tea leaves indicate that Password Manager might/may/possibly/perhaps/could be valid once again early next year. Its being worked on by some of the smartest technicians NorthEast of Anywhere. Welcome to the Community Forums? Would you by any chance have recently renewed your subscription and in the process happened to get a new keycode and therefore perhaps provided a different email address for registration? Just a thought as doing something like that could cause the issue you are describing. Thanks for the reply but I have had Webroot for about six weeks with no changes to the key. OK, was worth checking first off. Next thing to try to resolve it you can try running the Toolbarfix tool. You can download it for HERE. 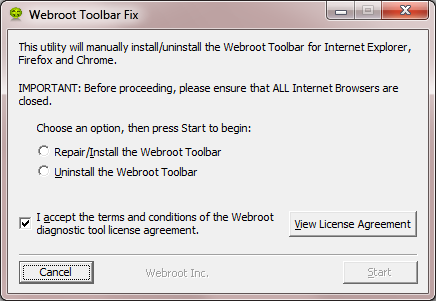 on which you should choose/check the option 'Repair/Install the Webroot Toolbar' and then press 'Start'. One then double clicks on that so that the login dialog is presented, etc. Please check the above out and come back if anything is not clear or if it does not help/respond to your query, and we can try something further. Thanks again fo your reply. I tried that prior to posting here. I tried again just for fun. Same thing. The Webroot icon is greyed out and trying to sign in after clicking it returns a red bar with inknown email address Try again. Again I am using the same email address and password that opens mywebroot.com. OK, well, again, worth a try. No, I haven't tried a uninstall / clean install. I would uninstall WSA from the windows control panel and then install it from the product CD unless you have a better idea. And then check out if the issue is till present or has been resolved. If it has not then I would Open a Support Ticket to get the Support Team to look into the issue for you. The service is free of charge to WSA users with an active subscription. An uninstall / clean install did not resolve the issue. My first computer was an 8086 with DOS 3.3 back in 1988. Since then I have built several computers from parts I bought at computer fairs or ebay. I have an I7 desktop I built, a laptop and for Christmas I bought my wife a Surface Pro at Best Buy. They gave me a 90 day Webroot subscription for free. 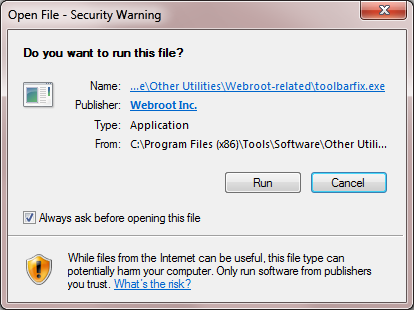 I did not install Webroot on the Surface Pro, I installed my security software of choice, ESET. I have uses ESET on many computers for several years and they were having a sale so I was able to get it inexpensivly. I recently got another computer, the ESET sale was over so I thought I would take a look at Webroot. I have 51 days left and have not made up my mind yet if I am going to keep it or spring for ESET. Anyway this issue bugs me because people at work bring me their broken or more. commonly infected computers and I fix them. I don"t really need this password manager, but it is there and it is annoying that I can't figure out the error with the ign in. Thank tou for your effort and help.If you come up wwith any more thoughts I'll look back here. An uninstall / clean install did not resolve the issue. My first computer was an 8086 with DOS 3.3 back in 1988. Since then I have built several computers from parts I bought at computer fairs or ebay. I have an I7 desktop I built, a laptop and for Christmas I bought my wife a Surface Pro at Best Buy. They gave me a 90 day Webroot subscription for free. I did not install Webroot on the Surface Pro, I installed my security software of choice, ESET. I have uses ESET on many computers for several years and they were having a sale so I was able to get it inexpensivly. I recently got another computer, the ESET sale was over so I thought I would take a look at Webroot. I have 51 days left and have not made up my mind yet if I am going to keep it or spring for ESET. Anyway this issue bugs me because people at work bring me their broken or more. commonly infected computers and I fix them. I don"t really need this password manager, but it is there and it is annoying that I can't figure out the error with the sign in. Thank tou for your effort and help.If you come up wwith any more thoughts I'll look back here. Sorry to hear that this did not work...I would now recommend that you Open that Support Ticket suggested earlier. I am sure that the Support Team will sort it out for you and then you will have the answer to that "...annoying that I can't figure out the error with the sign in" issue. And when you do and they do sort it out please post back here to let us know what the solution was...such feedback is extremely useful to us in the Community as it will assist us should other users come here for help in the future presenting with the same or similar problems. Thank you for getting back to me. In all my years with computers I have found that 90% of issues have such a simple answer that you feel like an idiot when it finally hits you. 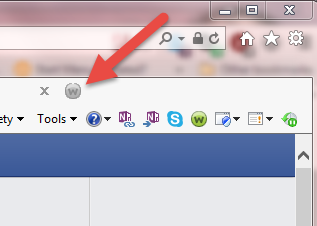 The grey W icon is always on the tool bar and clicking on it gives you a sign in box. when I filled out that box I got the message about the unknown email address. I finally figured out that you have to set it up from within the "passwords" section of mywebrootanywhere website. Once there I could click on the grey W icon, input my email and password and the grey W turned to green. Problem solved. I don't know why it took me so long to figure it out, I guess mabe I'm getting old. I'm still on the fence about whether or not to keep Webroot or go for ESET. Thank you again for all your input. Well, well done for sorting it...having said that you should not have needed to resort to setting it up the way that you did...so there was something not happening right there...but now that it is sorted it is sorted and that does not matter anyway. Hope that you will go the Webroot way...much as I admire ESET...I LOVE WSA...and that is just one of the differences between Webroot and the rest of the pack. Same here. And I am unable to talk or even email directly to webroot. Very frustrating! I have the same problem. I can log into my account on the website, and access everything except passwords. My subscription was automatically renewed a few weeks ago, but I never changed any email or anything else. I can't get the toolbar to open to fill in passwords or form fills.I tried the toolbar fix, but it didn't fix anything. What the heck is going on? I keep getting a red stripe across the top of the page that says "An error occurred while attempting to contact the server. Please check your Internet connection." But I don't have a problem with my internet. @ROBERT1725 I have to take my hat off to you, but that is a brilliant answer. You never know, it may gone down in legends like the marie celeste, it is still there 100 years time but empty, nothing in there and just a shell. Hi Jasper_The_Rasper, I wanted to start off the New Year with a bit of humor considering that the PM fiasco has bugged me. Its the lack of communication that chaps my hide. My bet is that it wont be available any longer and Webroot is hoping it will become an out of sight, out of mind thing. I guessed that you did it for that reason. It has bugged members for months with what seems like no real end in sight which is a shame. I am using an older version of FF so that I can still use the PM but I have a feeling we will hear something positive in the next few weeks.